We at Zaxis Modern are honoured to have had some of our projects featured in the following publications. 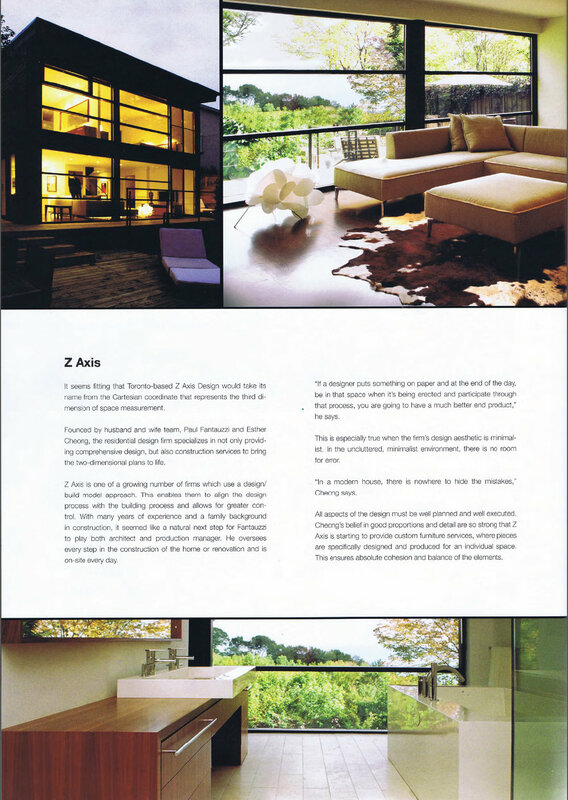 Please note that Zaxis Modern is formerly known as Z Axis Design, as referred to in the clippings below. A modern house bathed in light perches high above a forest canopy, soaking up a view of Lake Ontario over the treetops. It sounds idyllic but when Esther Cheong and Paul Fantauzzi purchased this property located atop the Scarborough Bluffs, it was something else altogether…. Minimalism warms up with walnut and wood-grained marble. You don’t even have to ask: Esther Cheong and Paul Fantauzzi of design-build firm Z Axis Design are definitely minimalists. The colour palette of this contemporary ensuite is decidedly neutral, the materials organic and the accessories kep to the bare essentials. And, yet, this bathroom is anything but boring, thanks to a strong connection to the outdoors and a breathtaking Bianco Wood marble feature wall…. The traditional houses facing Lake Ontario in Toronto's Beaches neighbourhood have tended to shelter their residents beneath porches and behind shutters. z axis design has taken the determinedly opposite approach in building a glass cube that reaches out to the lake. The firm's husband-and-wife principals, Esther Cheong and Paul Fantauzzi, believe that many home buyers today crave modern design and a connection with the outdoors…. Formerly ensconced in Toronto’s central Riverdale neighbourhood, designer Esther Cheong and husband Paul Fantauzzi, an architecture graduate, thought they were resolute urbanites. A few years ago, they started to think about building a new home, researching areas of the city that are near a ravine or the lake. They hadn’t initially considered the suburbs, but when a Scarborough Bluffs bungalow with a walkout basement and breathtaking lake vista came on the market, they snapped it up…. It seems fitting that Toronto-based Z Axis Design would take its name from the Cartesian coordinate that represents the third dimension of space measurement. Founded by husband and wife team, Paul Fantauzzi and Esther Cheong, the residential design firm specializes in not only providing comprehensive design, but also construction services to bring the two-dimensional plans to life. To read or print this article as a PDF, click here. The disparate dreams of two distinct design aesthetics—those of hip downtown loft dwellers and (usually suburban) family types—have both been fulfilled in Esther Cheong and Paul Fantauzzi’s home in Toronto’s Riverdale neighbourhood. As the owners of Z Axis Design, the husband-and-wife team have transformed a boxy 1950s triplex, creating a new hybrid—the four-bedroom family home that looks and feels like a loft…. To read or print this entire article as a PDF, click here.